Celebrate Memorial Day in a healthy way with this tasty and healthy Memorial Day recipe hand-picked for you and sure to fool party guests into eating healthy! 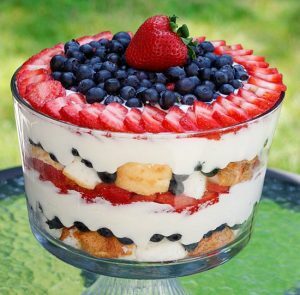 This Red, White and Blueberry Trifle is a beautiful, guiltless dessert that will make your Memorial Day gathering proud. A heavenly mixed berry trifle made with summer fresh blueberries, strawberries, white chocolate pudding, angel foods cake and whipped cream. Arrange half of the cake in the bottom of a 14-cup trifle dish. Sprinkle evenly with a layer of blueberries. Spread half of the cream mixture over the blueberries and gently spread. Top with a layer of strawberries. Layer the remaining cake cubes on top of the strawberries, then add more blueberries and top with the remaining cream mixture. Finish with the remaining strawberries and blueberries, arranging them in a pretty pattern. Cover and refrigerate at least one 1 hour.